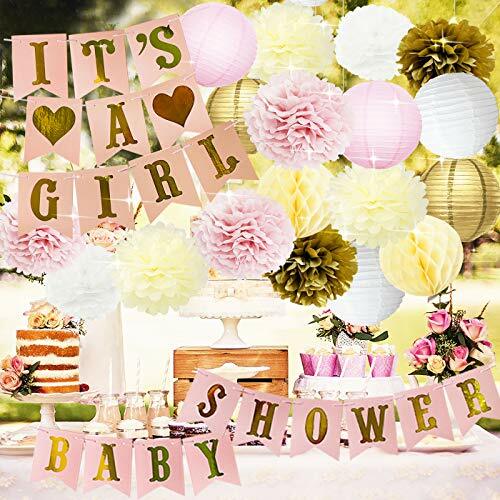 Pretty and popular pink cream white gold tissue paper pom pom paper lantern paper honeycomb balls and baby shower banner package, warm colors party decorations, include 12pcs mixed color tissue paper pom poms; 6pcs mixed color paper lanterns, 2pcs cream paper honeycomb balls; 1pc BABY SHOWER banner; 1pc IT'S A GIRL banner. Perfect for baby girl's birthday, girl's first birthday party decorations, baby shower decorations, nursery decorations or other celebration. An economical way to add a bright and warm color to your baby shower/girl's first birthday party or just decorate your nursery room. Each tissue paper pom pom and paper honeycomb ball has a short white ribbon for easy display. Pre-folded and pre-cut, all you need is to fluff them out and assemble the BABY SHOWER IT'S A GIRL banner. Material: high quality cardstock; high quality tissue paper. Color: baby pink, pink, cream, white, gold. High quality paper for long-time and sturdy hanging decor. If you have any questions about this product by HappyField, contact us by completing and submitting the form below. If you are looking for a specif part number, please include it with your message.